SFU public health researcher Anne-Marie Nicol suspects residents on Vancouver's North Shore and the Sea-to-Sky corridor are at risk of radon exposure. A public health researcher says radon exposure on Vancouver's North Shore and the Sea-to-Sky corridor is a potential health hazard and she wants the B.C. government to change provincial building codes to reflect the risk. Anne-Marie Nicol, a public health researcher, is handing out free radon test kits to residents in the region as part of a citizen science project at Simon Fraser University. The tests take 91 days to complete and Nicol says she expects the results will prove the province should re-categorize the area as having high radon potential. The B.C. Building Code separates the province into two areas based on their potential for radon exposure. 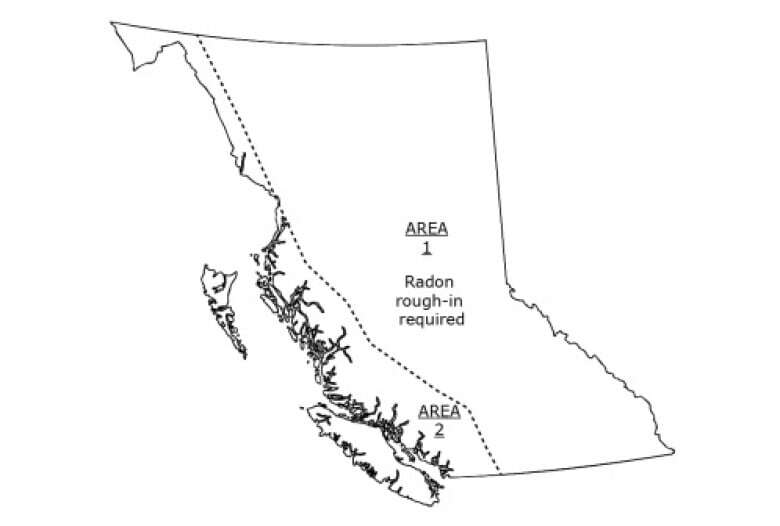 Radon Area 1 is east of the Coast Mountains and covers the Interior of the province. Radon Area 2 covers everything west of the mountains. Radon gas forms when uranium erodes into the soil. People living in homes built on top of contaminated soil are at risk because the radioactive gas can seep inside. According to Health Canada, radon kills 3,200 Canadians a year and is the second leading cause of lung cancer after smoking. Under the current building code, all new buildings in Area 1, east of the Coast Mountains which includes the Interior, must have a vent pipe installed to move radon gas out of the structure. There is no vent requirement in Area 2, everything west of the mountains, because it is considered a low radon potential region. Nicol says the Coast Mountains are rich in uranium and this creates the perfect conditions for potential radon poisoning. "North and West Vancouver and the Sea-to-Sky appear to have higher levels of uranium in the ground and they look a lot more like the Interior than the rest of Vancouver," Nicol said. A becquerel is the unit scientists use to measure radioactivity. Health Canada says radon measurements higher than 200 becquerels per cubic metre (200 Bq/m3) are a health risk. Alan Whitehead, the president of Radon Environment Management Corp., tests homes for radon from Whistler to North Vancouver. In the last three years, Whitehead says he has found radon levels between 600 Bq/m3 and 1,000 Bq/m3 in four West Vancouver homes. Whitehead says at least 12 North Vancouver homes also tested above Health Canada safety levels. "New homes often have a problem because they are constructed with energy conservation in mind. They are tighter and have less ventilation, creating a perfect storm for the build-up of radon gas," said Whitehead. "You can't protect one group of citizens and not another when you know there is a potential health hazard," said Whitehead. The B.C. government is proposing changes to the building code and is seeking public feedback until Feb. 28. "There is new evidence of radon in buildings in areas that were formerly not known to have elevated levels of radon," said the Ministry of Municipal Affairs and Housing in a statement. The proposed changes would make municipalities in Area 2 responsible for establishing their own radon data and determining if radon vents should be mandatory. Whitehead says this is a mistake. "You don't want people who don't understand [the problem] to try and determine if they have a municipal problem. It's a health risk." Vancouver Coastal Health is also currently conducting tests in area schools, placing radon detection devices in classrooms in North Vancouver, West Vancouver, the Sea-to-Sky region, Powell River and the Central Coast. Nicol will be at the North Vancouver City Library on Monday, Feb. 26 from 4 to 7 p.m. PT giving away test kits. "We need people to be engaged and researching the radon gas levels in their homes," said Nicol. "I'm hoping we can collect enough evidence from people's homes to inform building code changes."